Happy Monday! Hope everyone had a wonderful weekend. Mine was filled with writing which is, I know, as it should be. Among the things I wrote was a guest post over at Books Make Me Happy about music and writing. And the news that is big news is also mentioned in that post. So, you know, head on over and have a looksee. And then plan to head over tomorrow for a REAL looksee. An Alien Research related looksee, by the way. Next, head over to Nocturnal Book Reviews to see what she thinks of the whole Alien/Katherine "Kitty" Katt series. Speaking of which, have you funded the Kaiju Rising: Age of Monsters Kickstarter yet? We've unlocked every author so far, and now only have one amazing artwork level yet. Can we hit it? I hope so. Have you funded? I hope so again! Because it's gonna be not just huge, but kaiju huge! Which, as we all know, is huger than huge! So if you haven't gotten kaiju fever yet, visit the Kickstarter, check it out, and fund if you can, because it's going to be so very, very worth it. 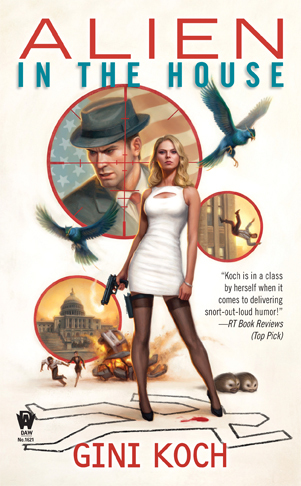 BTW, there are still tuckerizations left -- not mine, but you can't go wrong with any of the authors involved. So if you want to be in a story that's in a wicked cool anthology, check out the remaining options and get yourself kaijued! Well, that's it for today, but as always, more's on the way. So enjoy the start of the week and let's be readers out there! Happy Friday! I know, I've been quiet for a little while, but that's because I've been busy. With what, you ask, aside from working on Alien Collective? (Yes, that title comes from all of youuuuuu...) Well, let's get to today's update and you'll find out! First up, the yap is large and in charge over at Bookworm Blues talking about anthologies, and kaiju anthologies in particular. Speaking of which, Kaiju Rising: Age of Monsters Kickstarter is funded AND we've reached the interior artwork (which is gonna be AMAZING) and the first AND second stretch author (the great Kane Gilmour and Howard Andrew Jones) levels. But there are more levels to go, including getting to stories from two other awesome authors ( Peter Stenson and James Swallow ) and a super duper artwork level. So if you haven't joined the Rising yet and funded this cool anthology, what are you waiting for? Next up, check out what Love Rocks thought of The Night Beat. Then, head over to see which book series Larissa's Bookish Life chose as her all-time faves. The Book Junkies Choice Awards are lining up, and they have their finalists all chosen. So please be prepared to start voting for Alien in the House for Best SciFi, please and thank you! Voting for this category opens October 14. Now, bookmark the Books Make Me Happy blog. Why? Because on Monday I'll be guest posting over there...and on Tuesday I'll be revealing the cover for Alien Research there. Yes! And why there instead of at my own site, you ask? Well, I'm revealing there because there will be a very cool contest also being announced over there in conjunction with my cover reveal...a contest that relates to the Coastal Magic event. So, get ready -- next week's gonna be big. Kaiju big, really. That's it for today, but, as just stated, more's definitely on the way. So enjoy the weekend, and let's be readers out there. Peace out, my li'l gangstas, and I'll catch you on the flip side! Happy Monday! Hope everyone had a wonderful weekend and that your weeks are starting out well. Mine's starting out busy, so let's get to it, shall we? First up, as my Hook Me Up! subscribers already know, the yap is large and in charge over at Pearls Cast Before a McPig, where there's not only an interview with moi, but also two chances to win a copy of either Alien Proliferation, Alien Diplomacy, or Alien vs. Alien. Be sure to leave a comment at the blog to get entered for the second contest! And that's not all. 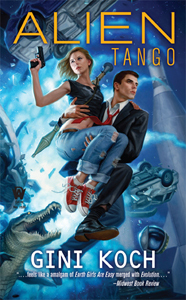 Hit Between Dreams and Reality to see what she thought of Alien Tango AND to get entered to win either Touched by an Alien, Alien Tango, or Alien in the Family. And if you'd like, check out her review in French. 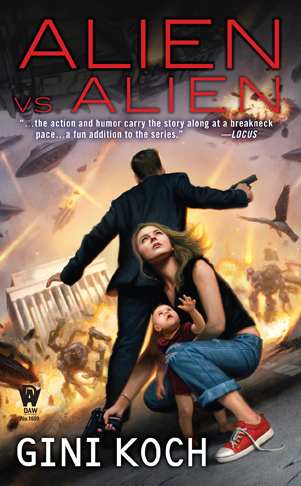 Speaking of reviews, head over and see what Bitten By Books thought of Alien vs. Alien and Alien in the House. Have you backed the Kaiju Rising: Age of Monsters Kickstarter yet? If not, what are you waiting for? Lots of great horror authors, including moi writing as J.C. Koch, will be in this one, and there are fantastic stretch goal prizes as well. And, whether or not you've funded, check out the latest coolness -- Kaiju Plushies! AND there's a Backer Badge on the same page -- we just keep on with the giving! If you've already pledged, don't worry, it's simple to add on "Cookie Monster". If you haven't, well, don't delay, fund today! Godzilla, Cookie Monster, and their cronies say it's the right thing to do! For all Central and Northern Arizona peeps, I'll be presenting Writing from the Hindbrain and Archetypes, Stereotypes & Cliches at the NARWA meeting on this Saturday, September 21, from 11am-2pm, at the Prescott Golf & Country Club, 1030 Prescott Country Club Blvd., Dewey, AZ 86327. Come hear a dozen successful, published authors, including moi, talk about the how-tos and the why-tos of writing. I'll be presenting Finding Your Voice, and also be part of the What Does it Take to Get Happily Published Today? panel. This is a must attend for all aspiring authors and readers who just want to know more about the process and the business...and, seriously, while we could easily charge hundreds of dollars for this event and it would be more than worth it, we mean it when we say that it's FREE. At the Scottsdale Civic Center Library, Scottsdale, AZ. I'll be running the yap and signing Alien Research at the annual Mysterious Galaxy San Diego Holiday Party on Saturday, December 7th, from 3pm-6pm. I'll be the Local Author Guest of Honor at DarkCon, in Phoenix, AZ, January 9-12, 2014. Don't miss out on my first real official and not last minute Guest of Honor stint. There are a few more VIP tickets left, and there's going to be a whole Mini Gini Con at this event, so, truly, don't miss this one! 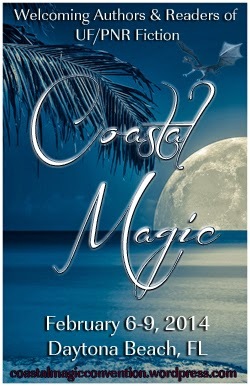 I'll be one of the authors at Coastal Magic, in Daytona Beach, FL, February 6-9, 2014. This will be one of my only, if not THE only, southern & east coast appearances in 2014, so don't miss the chance to come see the me, along with a TROVE of other awesome paranormal and urban fantasy authors. I have another January announcement coming up in the near future, and many more appearances in 2014, but for now, that's it for today 'cause, well, I have all that writing to get back to. But, in addition to that other announcement, as always, there's more on the way. So, enjoy the week ahead and let's be readers out there. Peace out, my li'l gangstas, and I'll catch you on the flip side! I know, I know...I've been back from WorldCon for a week and yet you haven't heard from me. WorldCon was made of awesome, by the way. But I'll catch you up on that later. (And I can HEAR you all going, "Oh yeah? 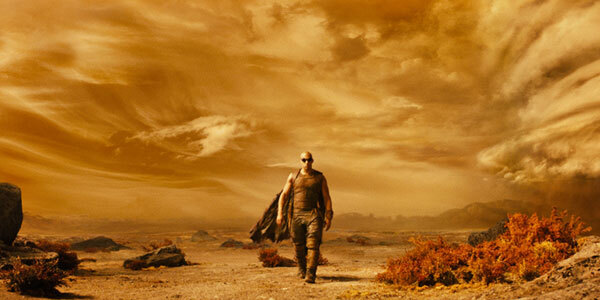 Like you've caught us up on Phoenix Comicon and San Diego Comic-Con and CopperCon? Just like that, Gini?" And I say, "Yeah! Just like that! Only WITH information. Coming soon. I swear!" But I digress...) And there's been so much going on! Well, um, that's part of why you haven't heard from me. LOL Well, that and the combo of jet lag and con lag that have had me moving in molasses. But, enough whining -- let's get to the stuff! First up, I'm in a new Kickstarter anthology, writing as J.C. Koch, and this one's about monsters! Kaiju Rising: Age of Monsters to be exact! There are a ton of cool levels and even more cool horror authors involved, so head on over and fund it today! 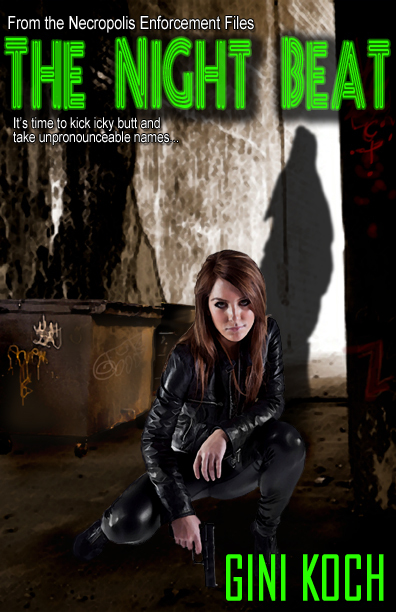 After that, head over to The Nameless Zine, where there's an interview with awesome SF/F author L.E. 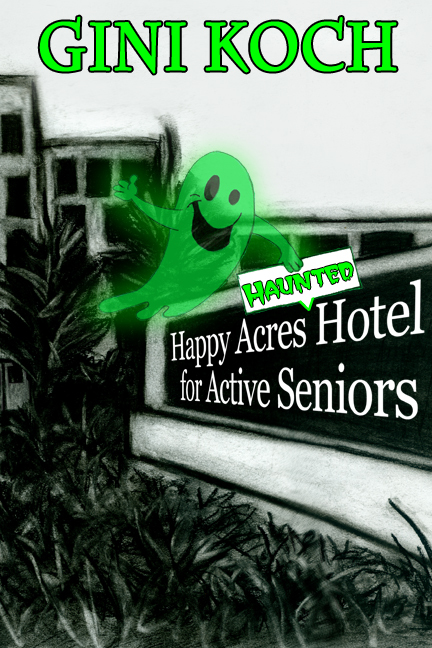 Modesitt, Jr. as well as a review of The Happy Acres Haunted Hotel for Active Seniors in The Book Nook section. Then see what SF Reader has to say about Alien Proliferation. Then hit Gizmo's Reviews and see who she thinks are the Top Ten Most Memorable Secondary Characters. Speaking of reviews, check out what I thought of "Riddick" over at Slice of SciFi. And now, for the upcoming events! First off, for those of you in the Central and Northern Arizona areas, I'll be up at the NARWA meeting on Saturday, September 21, doing not one but TWO presentations -- Writing from the Hindbrain at 11am, and Archetypes, Stereotypes & Cliches at 1pm. Join us if you're able, at the Prescott Golf & Country Club, 1030 Prescott Country Club Blvd., Dewey, AZ 86327. Next up, I'll be doing a live chat with the other members of the Paranormal Dream Team -- Erin Quinn, Erin Kellison, and Caris Roane (like us on Facebook!) -- over at the Literal Addiction Paranormal Book Club, on Thursday, October 10, from 7:00-8:30pm EST. And yes, there WILL be prizes, so don't miss out! Then, on Saturday, November 9th, it's the 8th Annual FREE Fall Writer's Workshop, where I'll be presenting Finding Your Voice, and will also be on a panel of successful published authors to tell you What Does It Take to be Happily Published Today? The Workshop runs from 9:30am-4:30pm, Scottsdale Civic Center Library, 3839 Drinkwater Blvd., Scottsdale, AZ 85251. We could charge a lot for this event...but we don't, so be sure you take advantage of all the great education being offered! That's it for today, but as always, more's on the way. So enjoy the rest of the week and let's be readers out there!